Denomination : Silver espadim de bolhao. Size : 22.1 x 22.5 mm. Weight : 1.57 grams. Obverse : Shield with three semi-circles to the sides and at the top, with a fragmentary inscription around (only about 1/3 of it is visible due to weak areas on the strike). 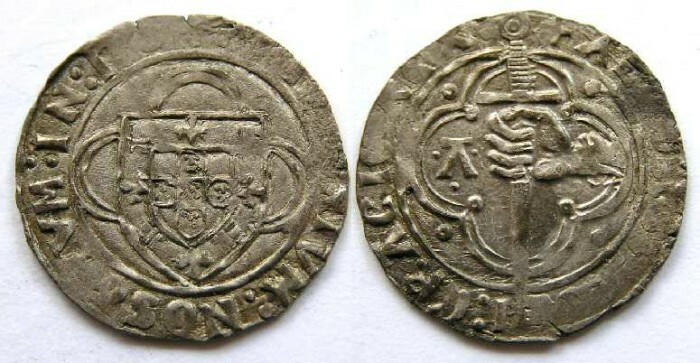 Reverse : Hand holding a sword, in a four lobed circle, with a partial (due to weak strike) inscription around. I apologize for not having the full inscriptions available, but they are too weak to fully read on the coin, and I do not have a copy of Bat Reis in hand to look them up.